A few days ago I wrote a quick summary of a project that we just completed (and you may find it helpful to read that post first). In this project, we looked for new particles at the Large Hadron Collider (LHC) in a novel way, in two senses. Today I’m going to explain what we did, why we did it, and what was unconventional about our search strategy. Today, a small but intrepid band of theoretical particle physicists (professor Jesse Thaler of MIT, postdocs Yotam Soreq and Wei Xue of CERN, Harvard Ph.D. student Cari Cesarotti, and myself) put out a paper that is unconventional in two senses. First, we looked for new particles at the Large Hadron Collider in a way that hasn’t been done before, at least in public. And second, we looked for new particles at the Large Hadron Collider in a way that hasn’t been done before, at least in public. And no, there’s no error in the previous paragraph. 1) We used a small amount of actual data from the CMS experiment, even though we’re not ourselves members of the CMS experiment, to do a search for a new particle. Both ATLAS and CMS, the two large multipurpose experimental detectors at the Large Hadron Collider [LHC], have made a small fraction of their proton-proton collision data public, through a website called the CERN Open Data Portal. Some experts, including my co-authors Thaler, Xue and their colleagues, have used this data (and the simulations that accompany it) to do a variety of important studies involving known particles and their properties. [Here’s a blog post by Thaler concerning Open Data and its importance from his perspective.] But our new study is the first to look for signs of a new particle in this public data. While our chances of finding anything were low, we had a larger goal: to see whether Open Data could be used for such searches. We hope our paper provides some evidence that Open Data offers a reasonable path for preserving priceless LHC data, allowing it to be used as an archive by physicists of the post-LHC era. 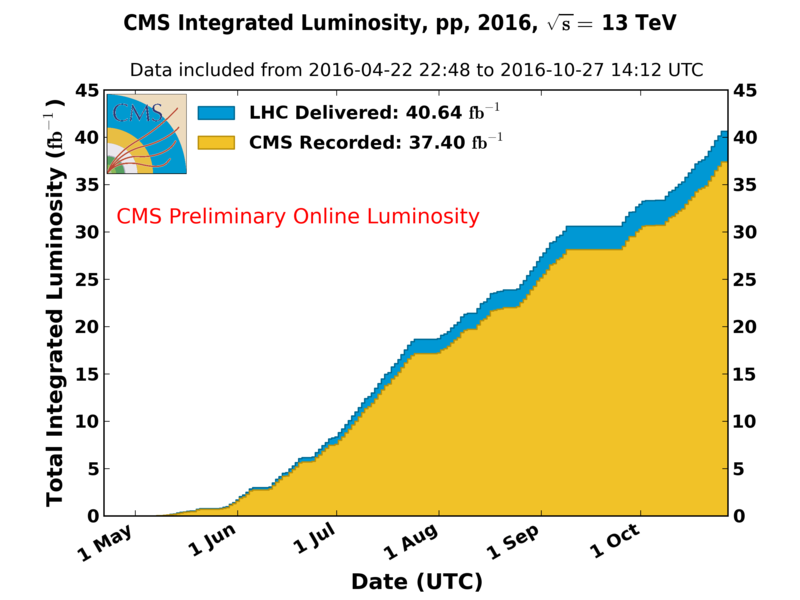 2) Since only had a tiny fraction of CMS’s data was available to us, about 1% by some count, how could we have done anything useful compared to what the LHC experts have already done? Well, that’s why we examined the data in a slightly unconventional way (one of several methods that I’ve advocated for many years, but has not been used in any public study). Consequently it allowed us to explore some ground that no one had yet swept clean, and even have a tiny chance of an actual discovery! But the larger scientific goal, absent a discovery, was to prove the value of this unconventional strategy, in hopes that the experts at CMS and ATLAS will use it (and others like it) in future. Their chance of discovering something new, using their full data set, is vastly greater than ours ever was. All in all, this project took us two years! Well, honestly, it should have taken half that time — but it couldn’t have taken much less than that, with all we had to learn. So trying to use Open Data from an LHC experiment is not something you do in your idle free time. Nevertheless, I feel it was worth it. At a personal level, I learned a great deal more about how experimental analyses are carried out at CMS, and by extension, at the LHC more generally. And more importantly, we were able to show what we’d hoped to show: that there are still tremendous opportunities for discovery at the LHC, through the use of (even slightly) unconventional model-independent analyses. It’s a big world to explore, and we took only a small step in the easiest direction, but perhaps our efforts will encourage others to take bigger and more challenging ones. For those readers with greater interest in our work, I’ll put out more details in two blog posts over the next few days: one about what we looked for and how, and one about our views regarding the value of open data from the LHC, not only for our project but for the field of particle physics as a whole. At the end of April, as reported hysterically in the press, the Large Hadron Collider was shut down and set back an entire week by a “fouine”, an animal famous for chewing through wires in cars, and apparently in colliders too. What a rotten little weasel! especially for its skill in managing to get the English-language press to blame the wrong species — a fouine is actually a beech marten, not a weasel, and I’m told it goes Bzzzt, not Pop. But who’s counting? Particle physicists are counting. Last week the particle accelerator operated so well that it generated almost half as many collisions as were produced in 2015 (from July til the end of November), bringing the 2016 total to about three-fourths of 2015. The key question is how many of the next few weeks will be like this past one. We’d be happy with three out of five, even two. If the amount of 2016 data can significantly exceed that of 2015 by July 15th, as now seems likely, a definitive answer to the question on everyone’s mind (namely, what is the bump on that plot?!? a new particle? or just a statistical fluke?) might be available at the time of the early August ICHEP conference. A few weeks ago, the Large Hadron Collider [LHC] ended its 2015 data taking of 13 TeV proton-proton collisions. This month we’re getting our first look at the data. As many of you will have already read, the Large Hadron Collider [LHC], located at the CERN laboratory in Geneva, Switzerland, has “restarted”. Well, a restart of such a machine, after two years of upgrades, is not a simple matter, and perhaps we should say that the LHC has “begun to restart”. The process of bringing the machine up to speed begins with one weak beam of protons at a time — with no collisions, and with energy per proton at less than 15% of where the beams were back in 2012. That’s all that has happened so far. If that all checks out, then the LHC operators will start trying to accelerate a beam to higher energy — eventually to record energy, 40% more than in 2012, when the LHC last was operating. This is the real test of the upgrade; the thousands of magnets all have to work perfectly. If that all checks out, then two beams will be put in at the same time, one going clockwise and the other counterclockwise. Only then, if that all works, will the beams be made to collide — and the first few collisions of protons will result. After that, the number of collisions per second will increase, gradually. If everything continues to work, we could see the number of collisions become large enough — approaching 1 billion per second — to be scientifically interesting within a couple of months. I would not expect important scientific results before late summer, at the earliest. This isn’t to say that the current milestone isn’t important. There could easily have been (and there almost were) magnet problems that could have delayed this event by a couple of months. But delays could also occur over the coming weeks… so let’s not expect too much in 2015. Still, the good news is that once the machine gets rolling, be it in May, June, July or beyond, we have three to four years of data ahead of us, which will offer us many new opportunities for discoveries, anticipated and otherwise. and even if the LHC finds signs of something that behaves like dark matter (i.e. something that, like neutrinos, cannot be directly detected by LHC’s experiments), it will be impossible for the LHC to prove that it actually is dark matter. Proof will require input from other experiments, and could take decades to obtain. seeking either dark matter particles or particles that may be shown someday to be “associated” with dark matter. Finding dark matter itself is a worthy goal, but the LHC may simply not be the right machine for the job, and certainly can’t do the job alone. Why the discrepancy between these two views of LHC’s purpose? One possibility is that since everybody has heard of dark matter, the goal of finding it is easier for scientists to explain to journalists, even though it’s not central. And in turn, it is easier for journalists to explain this goal to readers who don’t care to know the real situation. By the time the story goes to press, all the modifiers and nuances uttered by the scientists are gone, and all that remains is “LHC looking for dark matter”. Well, stay tuned to this blog, and you’ll get a much more accurate story. Fortunately a much more balanced story did appear in the BBC, due to Pallab Ghosh…, though as usual in Europe, with rather too much supersymmetry and not enough of other approaches to the naturalness problem. Ghosh also does mention what I described in the italicized part of point 3 above — the possibility of what he calls the “wonderfully evocatively named `dark sector’ ”. [Mr. Ghosh: back in 2006, well before these ideas were popular, Kathryn Zurek and I named this a “hidden valley”, potentially relevant either for dark matter or the naturalness problem. We like to think this is a much more evocative name.] A dark sector/hidden valley would involve several types of particles that interact with one another, but interact hardly at all with anything that we and our surroundings are made from. Typically, one of these types of particles could make up dark matter, but the others would unsuitable for making dark matter. So why are these others important? Because if they are produced at the LHC, they may decay in a fashion that is easy to observe — easier than dark matter itself, which simply exits the LHC experiments without a trace, and can only be inferred from something recoiling against it. In other words, if such a dark sector [or more generally, a hidden valley of any type] exists, the best targets for LHC’s experiments (and other experiments, such as APEX or SHiP) are often not the stable particles that could form dark matter but their unstable friends and associates. But this will all be irrelevant if the collider doesn’t work, so… first things first. Let’s all wish the accelerator physicists success as they gradually bring the newly powerful LHC back into full operation, at a record energy per collision and eventually a record collision rate. After a couple of months of hard work on grant writing, career plans and scientific research, I’ve made it back to my blogging keyboard. I’m on my way to Switzerland for a couple of weeks in Europe, spending much of the time at the CERN laboratory. CERN, of course, is the host of the Large Hadron Collider [LHC], where the Higgs particle was discovered in 2012. I’ll be consulting with my experimentalist and theorist colleagues there… I have many questions for them. And I hope they’ll have many questions for me too, both ones I can answer and others that will force me to go off and think for a while. You may recall that the LHC was turned off (as planned) in early 2013 for repairs and an upgrade. Run 2 of the LHC will start next year, with protons colliding at an energy of around 13 TeV per collision. This is larger than in Run 1, which saw 7 TeV per collision in 2011 and 8 TeV in 2012. This increases the probability that a proton-proton collision will make a Higgs particle, which has a mass of 125 GeV/c², by about a factor of 2 ½. (Don’t try to figure that out in your head; the calculation requires detailed knowledge of what’s inside a proton.) The number of proton-proton collisions per second will also be larger in Run 2 than in Run 1, though not immediately. In fact I would not be surprised if 2015 is mostly spent addressing unexpected challenges. But Run 1 was a classic: a small pilot run in 2010 led to rapid advances in 2011 and performance beyond expectations in 2012. It’s quite common for these machines to underperform at first, because of unforeseen issues, and outperform in the long run, as those issues are solved and human ingenuity has time to play a role. All of which is merely to say that I would view any really useful results in 2015 as a bonus; my focus is on 2016-2018. Isn’t it a bit early to be thinking about 2016? No, now is the time to be thinking about 2016 triggering challenges for certain types of difficult-to-observe phenomena. These include exotic, unexpected decays of the Higgs particle, or other hard-to-observe types of Higgs particles that might exist and be lurking in the LHC’s data, or rare decays of the W and Z particle, and more generally, anything that involves a particle whose (rest) mass is in the 100 GeV/c² range, and whose mass-energy is therefore less than a percent of the overall proton-proton collision energy. The higher the collision energy grows, the harder it becomes to study relatively low-energy processes, even though we make more of them. To be able to examine them thoroughly and potentially discover something out of place — something that could reveal a secret worth even more than the Higgs particle itself — we have to become more and more clever, open-minded and vigilant. What if the Large Hadron Collider Finds Nothing Else? In my last post, I expressed the view that a particle accelerator with proton-proton collisions of (roughly) 100 TeV of energy, significantly more powerful than the currently operational Large Hadron Collider [LHC] that helped scientists discover the Higgs particle, is an obvious and important next steps in our process of learning about the elementary workings of nature. And I described how we don’t yet know whether it will be an exploratory machine or a machine with a clear scientific target; it will depend on what the LHC does or does not discover over the coming few years. What will it mean, for the 100 TeV collider project and more generally, if the LHC, having made possible the discovery of the Higgs particle, provides us with no more clues? Specifically, over the next few years, hundreds of tests of the Standard Model (the equations that govern the known particles and forces) will be carried out in measurements made by the ATLAS, CMS and LHCb experiments at the LHC. Suppose that, as it has so far, the Standard Model passes every test that the experiments carry out? In particular, suppose the Higgs particle discovered in 2012 appears, after a few more years of intensive study, to be, as far the LHC can reveal, a Standard Model Higgs — the simplest possible type of Higgs particle? Before we go any further, let’s keep in mind that we already know that the Standard Model isn’t all there is to nature. The Standard Model does not provide a consistent theory of gravity, nor does it explain neutrino masses, dark matter or “dark energy” (also known as the cosmological constant). Moreover, many of its features are just things we have to accept without explanation, such as the strengths of the forces, the existence of “three generations” (i.e., that there are two heavier cousins of the electron, two for the up quark and two for the down quark), the values of the masses of the various particles, etc. However, even though the Standard Model has its limitations, it is possible that everything that can actually be measured at the LHC — which cannot measure neutrino masses or directly observe dark matter or dark energy — will be well-described by the Standard Model. What if this is the case? In science, giving strong evidence that something isn’t there can be as important as discovering something that is there — and it’s often harder to do, because you have to thoroughly exclude all possibilities. [It’s very hard to show that your lost keys are nowhere in the house — you have to convince yourself that you looked everywhere.] A famous example is the case of Albert Michelson, in his two experiments (one in 1881, a second with Edward Morley in 1887) trying to detect the “ether wind”. Light had been shown to be a wave in the 1800s; and like all waves known at the time, it was assumed to be a wave in something material, just as sound waves are waves in air, and ocean waves are waves in water. This material was termed the “luminiferous ether”. As we can detect our motion through air or through water in various ways, it seemed that it should be possible to detect our motion through the ether, specifically by looking for the possibility that light traveling in different directions travels at slightly different speeds. This is what Michelson and Morley were trying to do: detect the movement of the Earth through the luminiferous ether. Both of Michelson’s measurements failed to detect any ether wind, and did so expertly and convincingly. And for the convincing method that he invented — an experimental device called an interferometer, which had many other uses too — Michelson won the Nobel Prize in 1907. Meanwhile the failure to detect the ether drove both FitzGerald and Lorentz to consider radical new ideas about how matter might be deformed as it moves through the ether. Although these ideas weren’t right, they were important steps that Einstein was able to re-purpose, even more radically, in his 1905 equations of special relativity. In Michelson’s case, the failure to discover the ether was itself a discovery, recognized only in retrospect: a discovery that the ether did not exist. (Or, if you’d like to say that it does exist, which some people do, then what was discovered is that the ether is utterly unlike any normal material substance in which waves are observed; no matter how fast or in what direction you are moving relative to me, both of us are at rest relative to the ether.) So one must not be too quick to assume that a lack of discovery is actually a step backwards; it may actually be a huge step forward. There were various attempts to make sense of Michelson and Morley’s experiment. Some interpretations involved tweaks of the notion of the ether. Tweaks of this type, in which some original idea (here, the ether) is retained, but adjusted somehow to explain the data, are often referred to as “epicycles” by scientists. (This is analogous to the way an epicycle was used by Ptolemy to explain the complex motions of the planets in the sky, in order to retain an earth-centered universe; the sun-centered solar system requires no such epicycles.) A tweak of this sort could have been the right direction to explain Michelson and Morley’s data, but as it turned out, it was not. Instead, the non-detection of the ether wind required something more dramatic — for it turned out that waves of light, though at first glance very similar to other types of waves, were in fact extraordinarily different. There simply was no ether wind for Michelson and Morley to detect. If the LHC discovers nothing beyond the Standard Model, we will face what I see as a similar mystery. As I explained here, the Standard Model, with no other particles added to it, is a consistent but extraordinarily “unnatural” (i.e. extremely non-generic) example of a quantum field theory. This is a big deal. Just as nineteenth-century physicists deeply understood both the theory of waves and many specific examples of waves in nature and had excellent reasons to expect a detectable ether, twenty-first century physicists understand quantum field theory and naturalness both from the theoretical point of view and from many examples in nature, and have very good reasons to expect particle physics to be described by a natural theory. (Our examples come both from condensed matter physics [e.g. metals, magnets, fluids, etc.] and from particle physics [e.g. the physics of hadrons].) Extremely unnatural systems — that is, physical systems described by quantum field theories that are highly non-generic — simply have not previously turned up in nature… which is just as we would expect from our theoretical understanding. So what might it mean if an unnatural quantum field theory describes all of the measurements at the LHC? It may mean that our understanding of particle physics requires an epicyclic change — a tweak. The implications of a tweak would potentially be minor. A tweak might only require us to keep doing what we’re doing, exploring in the same direction but a little further, working a little harder — i.e. to keep colliding protons together, but go up in collision energy a bit more, from the LHC to the 100 TeV collider. For instance, perhaps the Standard Model is supplemented by additional particles that, rather than having masses that put them within reach of the LHC, as would inevitably be the case in a natural extension of the Standard Model (here’s an example), are just a little bit heavier than expected. In this case the world would be somewhat unnatural, but not too much, perhaps through some relatively minor accident of nature; and a 100 TeV collider would have enough energy per collision to discover and reveal the nature of these particles. Or perhaps a tweak is entirely the wrong idea, and instead our understanding is fundamentally amiss. Perhaps another Einstein will be needed to radically reshape the way we think about what we know. A dramatic rethink is both more exciting and more disturbing. It was an intellectual challenge for 19th century physicists to imagine, from the result of the Michelson-Morley experiment, that key clues to its explanation would be found in seeking violations of Newton’s equations for how energy and momentum depend on velocity. (The first experiments on this issue were carried out in 1901, but definitive experiments took another 15 years.) It was an even greater challenge to envision that the already-known unexplained shift in the orbit of Mercury would also be related to the Michelson-Morley (non)-discovery, as Einstein, in trying to adjust Newton’s gravity to make it consistent with the theory of special relativity, showed in 1913.
and were not immediately obvious to the practitioners in 1888. This should give us pause. We might, if we continue as we are, be heading in the wrong direction. Difficult as it is to do, we have to take seriously the possibility that if (and remember this is still a very big “if”) the LHC finds only what is predicted by the Standard Model, the reason may involve a significant reorganization of our knowledge, perhaps even as great as relativity’s re-making of our concepts of space and time. Were that the case, it is possible that higher-energy colliders would tell us nothing, and give us no clues at all. An exploratory 100 TeV collider is not guaranteed to reveal secrets of nature, any more than a better version of Michelson-Morley’s interferometer would have been guaranteed to do so. It may be that a completely different direction of exploration, including directions that currently would seem silly or pointless, will be necessary. This is not to say that a 100 TeV collider isn’t needed! It might be that all we need is a tweak of our current understanding, and then such a machine is exactly what we need, and will be the only way to resolve the current mysteries. Or it might be that the 100 TeV machine is just what we need to learn something revolutionary. But we also need to be looking for other lines of investigation, perhaps ones that today would sound unrelated to particle physics, or even unrelated to any known fundamental question about nature. Let me provide one example from recent history — one which did not lead to a discovery, but still illustrates that this is not all about 19th century history. One of the great contributions to science of Nima Arkani-Hamed, Savas Dimopoulos and Gia Dvali was to observe (in a 1998 paper I’ll refer to as ADD, after the authors’ initials) that no one had ever excluded the possibility that we, and all the particles from which we’re made, can move around freely in three spatial dimensions, but are stuck (as it were) as though to the corner edge of a thin rod — a rod as much as one millimeter wide, into which only gravitational fields (but not, for example, electric fields or magnetic fields) may penetrate. Moreover, they emphasized that the presence of these extra dimensions might explain why gravity is so much weaker than the other known forces. Fig. 1: ADD’s paper pointed out that no experiment as of 1998 could yet rule out the possibility that our familiar three-dimensional world is a corner of a five-dimensional world, where the two extra dimensions are finite but perhaps as large as a millimeter. Given the incredible number of experiments over the past two centuries that have probed distances vastly smaller than a millimeter, the claim that there could exist millimeter-sized unknown dimensions was amazing, and came as a tremendous shock — certainly to me. At first, I simply didn’t believe that the ADD paper could be right. But it was. One of the most important immediate effects of the ADD paper was to generate a strong motivation for a new class of experiments that could be done, rather inexpensively, on the top of a table. 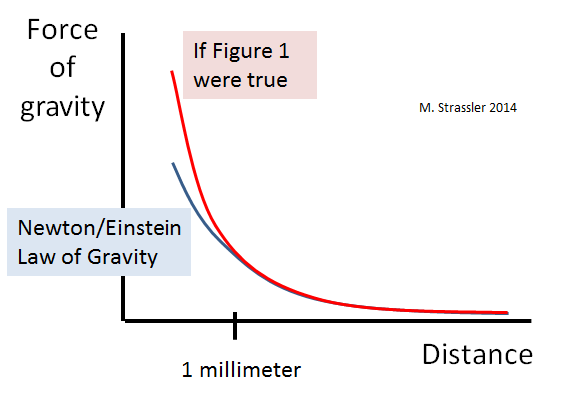 If the world were as they imagined it might be, then Newton’s (and Einstein’s) law for gravity, which states that the force between two stationary objects depends on the distance r between them as 1/r², would increase faster than this at distances shorter than the width of the rod in Figure 1. This is illustrated in Figure 2. Fig. 2: If the world were as sketched in Figure 1, then Newton/Einstein’s law of gravity would be violated at distances shorter than the width of the rod in Figure 1. The blue line shows Newton/Einstein’s prediction; the red line shows what a universe like that in Figure 1 would predict instead. Experiments done in the last few years agree with the blue curve down to a small fraction of a millimeter. These experiments are not easy — gravity is very, very weak compared to electrical forces, and lots of electrical effects can show up at very short distances and have to be cleverly avoided. But some of the best experimentalists in the world figured out how to do it (see here and here). After the experiments were done, Newton/Einstein’s law was verified down to a few hundredths of a millimeter. If we live on the corner of a rod, as in Figure 1, it’s much, much smaller than a millimeter in width. But it could have been true. And if it had, it might not have been discovered by a huge particle accelerator. It might have been discovered in these small inexpensive experiments that could have been performed years earlier. The experiments weren’t carried out earlier mainly because no one had pointed out quite how important they could be. Ok Fine; What Other Experiments Should We Do? So what are the non-obvious experiments we should be doing now or in the near future? Well, if I had a really good suggestion for a new class of experiments, I would tell you — or rather, I would write about it in a scientific paper. (Actually, I do know of an important class of measurements, and I have written a scientific paper about them; but these are measurements to be done at the LHC, and don’t involve a entirely new experiment.) Although I’m thinking about these things, I do not yet have any good ideas. Until I do, or someone else does, this is all just talk — and talk does not impress physicists. Indeed, you might object that my remarks in this post have been almost without content, and possibly without merit. I agree with that objection. Still, I have some reasons for making these points. In part, I want to highlight, for a wide audience, the possible historic importance of what might now be happening in particle physics. And I especially want to draw the attention of young people. There have been experts in my field who have written that non-discoveries at the LHC constitute a “nightmare scenario” for particle physics… that there might be nothing for particle physicists to do for a long time. But I want to point out that on the contrary, not only may it not be a nightmare, it might actually represent an extraordinary opportunity. Not discovering the ether opened people’s minds, and eventually opened the door for Einstein to walk through. And if the LHC shows us that particle physics is not described by a natural quantum field theory, it may, similarly, open the door for a young person to show us that our understanding of quantum field theory and naturalness, while as intelligent and sensible and precise as the 19th century understanding of waves, does not apply unaltered to particle physics, and must be significantly revised. Of course the LHC is still a young machine, and it may still permit additional major discoveries, rendering everything I’ve said here moot. But young people entering the field, or soon to enter it, should not assume that the experts necessarily understand where the field’s future lies. Like FitzGerald and Lorentz, even the most brilliant and creative among us might be suffering from our own hard-won and well-established assumptions, and we might soon need the vision of a brilliant young genius — perhaps a theorist with a clever set of equations, or perhaps an experimentalist with a clever new question and a clever measurement to answer it — to set us straight, and put us onto the right path.